As the Brexit debate deteriorates in quality at an alarming rate, it appears that any hope of Britain returning to its democratic senses is receding fast. The most recent cases include Ian Duncan Smith dismissing Kier Starmer, shadow Brexit minister (and former director of public prosecutions) as a “second-rate lawyer” for daring to request parliamentary scrutiny on the Brexit negotiations, and Brexit minister David Davis saying that disagreeing with Brexit is akin to thinking “17.5m people do not have the right to hold an opinion”. The decline in decorum among Brexiteers is disquieting. But just as concerning is the loss of focus on display among the pro-remain members of parliament. Harried and hectored by the language of the Brexiteers – labelled as “Bremoaners” by the Daily Mail, and dismissed as the liberal elite elsewhere – it seems Remainers are losing sight of some key procedures and practices of democratic governance. This is displayed most vividly in the insistence of most, if not all, pro-remain MPs to stress at every point that they “respect” the result of the June 23 vote and accept that Britain will leave the European Union. This position is potentially as damaging to this debate as the hyperbole of the Brexiteers. Of course, it is beyond question that any genuine democrat worthy of the name respects the vote – just as every four or five years, they respect the outcome of general elections. If I vote in a general election for party X, but party Y gets in, I respect the right of the latter to form a government, and to bring forward their policy programme. However, if I view any area of the policy as potentially damaging, unfair, or maliciously conceived or motivated, then I have at my disposal all of the usual democratic means to oppose it. I can write to my MP, start a campaign, start a protest group, write a blog or join a political party. I can expect that my representative in parliament will respond accordingly. None of this is ever seen as disrespectful for the people who voted for the party of government. In fact, quite the opposite is true – it is to be expected in a healthy democracy. Worryingly, in the heightened drama of the post-Brexit world, the role of dissent in parliamentary politics seems to have been forgotten. It’s true that the losing parties retreat to the opposition benches after an election but they are expected to be active once they get there. The whole system is designed to create dissent about the approach being taken by the winning side. The entire structure of both houses of parliament is defined by this relationship: between the party that has the democratic mandate to implement its policy and the party that has the democratic mandate to oppose and critique it. It is even expected to vote down that policy whenever possible. Indeed, British parliamentary history is littered with examples of legislation being successfully resisted. In 2005, parliament blocked Tony Blair’s attempt to allow terrorism suspects to be detained for 90 days without charge. In 2013, it voted against intervention in Syria. 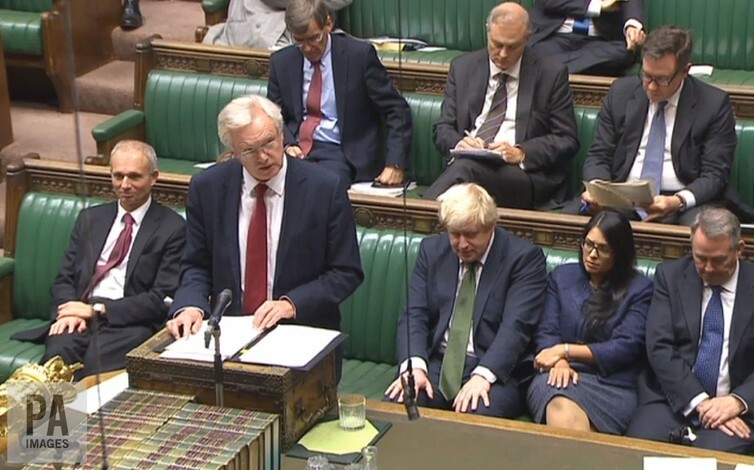 The Brexit front bench team. Having a mandate to implement a policy does not prevent a vocal and determined opposition from reversing decisions. At no stage in either of these cases did the British people deem opposition to the policies under discussion as somehow subverting the democratic will. So we could ask: why the need to constantly stress that those on the remain side do not want to reverse the decision of June 23? Why should the full role of dissent and opposition be abandoned in the case of the referendum? We should also remember another key element of the role of the minority in a democracy – to hold the majority to account not just in terms of policy, but in practice too. That is, if there is any suspicion of wrongdoing, of any underhand dealing, the minority has a responsibility to flag it up. In this sense, no matter which side British voters were on during the referendum, they were all badly let down. On the one hand were – and, please, let’s identify things correctly at this crucial political moment – the lies of the Leave campaign; so egregious and widely known are they that we need not repeat them here. But just as bad was the total misfiring of the Remain camp, from “project fear” to the Labour Party’s abandonment of any meaningful engagement whatsoever. Everyone, Leavers and Remainers, deserve better. So yes, let us all respect the referendum result on the June 23. But let us also note that it is precisely because of that respect that the case for a second referendum can be made, a referendum this time that might produce a campaign to deal more precisely and exactly with the issues at hand. The argument for a second referendum can be seen to be an entirely reasonable product of a minority that passionately believes that the Brexit course is not just damaging to Britain’s economic future, but to its political future as a progressive and open nation. In stating this position, the minority does not deny the opinion of the majority, but simply disagrees with it, and it is their democratic right to say so publicly. Indeed, more than this, with the stakes so high, a genuine respect for both sides in the referendum means that beyond their right, it is also their responsibility.